Supercars give automakers a chance to show off the fullest extents of their design and engineering capabilities. They use lightweight materials, advanced powertrains, and state-of-the-art suspension technologies to create the fastest, best handling, and most exotic automobiles on the planet. But there’s advanced technology and then there’s advanced technology. The 2017 Audi R8 is a traditional supercar—mid-engine design, big engine, lots of power, in a lightweight structure. The 2017 Acura NSX, however, is clearly more advanced and forward-thinking. It has all the traits of the R8, plus a state-of-the-art hybrid powertrain and pinpoint torque vectoring capabilities. The reborn Acura NSX makes the R8’s technology seem antiquated by comparison. 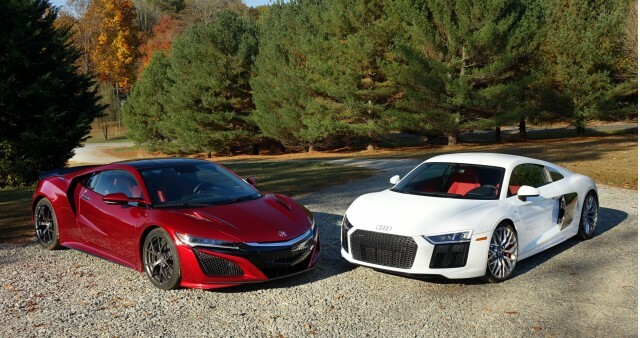 As part of our Best Car To Buy testing, we drove the NSX and R8 back to back starting at our home base in north Georgia. The cars were very similarly priced, making the comparison that much more appropriate for anyone thinking of ponying up the cash for a supercar. Our Ibis White R8 was the current base model, the V10 Coupe. On top of its $162,900 base price, it came with a Carbon exterior package (carbon side blades and engine compartment) for $5,600, a Diamond stitch leather package (full leather upholstery with diamond stitching on the seats and headliner) for $5,000, a Carbon interior package for $3,400, the $1,500 10-spoke 20-inch wheels, $700 red brake calipers, dynamic steering for $1,400, a $1,300 gas-guzzler tax, and a $1,250 destination charge for a total of $183,050. The base price of the NSX is $157,800 including destination. Our Valencia Red Pearl ($6,000) tester came loaded with carbon fiber exterior components totaling $21,600. They included the Carbon Fiber Exterior Sport package for $9,000, the $3,600 engine cover, the $6,000 roof panel, and the $3,000 rear decklid spoiler. Inside, it had Semi-Aniline Red Leather and Alcantara upholstery with power seats for $1,500, the $2,900 Interior Carbon Fiber Sport Package, and a black Alcantara headliner for $1,300. Add in the $9,900 for the carbon ceramic brakes with black calipers, and the total came to a whopping $199,200. The most notable option our tester lacked was the Pirelli or Michelin tires. More on that later. The NSX’s powertrain is one of the most complicated ever shoved into an automobile. It starts simply enough with a twin-turbocharged 3.5-liter V-6 rated at 500 horsepower, thanks in part to those turbos that can run at 15.2 psi. Mounted longitudinally over the car’s rear axle, the engine is mated to a direct drive motor that adds 47 horsepower to net output, charges the battery pack (which is mounted in front of the engine), and smooths out shifts. At the back end of the drivetrain there’s a 9-speed dual-clutch transmission and a limited-slip differential to help put the power to the pavement efficiently. Down the central spine of the car, where you would normally find a driveshaft, Acura adds a power drive unit that sends power form the battery to a pair of front motors, each of which adds up to 36 hp and 54 lb-ft of torque to its respective front wheel. These motors can power the car alone under light load conditions and provide highly focused torque-vectoring control. Total system output is 573 hp and 476 lb-ft of torque. Apple Will Allow Google Assistant To Replace Siri On iPhone 7s And iPhone 8: Is This Rumor True?